We are remarkable entity, engaged in offering superior quality of Feldspar Mineral. We introduce our company M/s Adinath Industries as a Manufacturer & Exporter of Feldspar of Grey and Pink color. We have exclusive agreements with K-Feldspar, Na Feldspar and Quartz Mine Owners for supply of Feldspar to Ceramic, Glass Industries as per requirements. Feldspar Mines are located in Rajasthan, Andhra Pradesh and nearest ports are Kandla / Mundra (Gujarat), Kakinada /Visakhapatnam (AP) and Chennai (Tamilnadu). 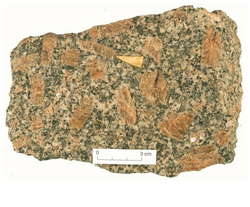 Feldspars are one of the most abundant rock forming minerals in the earth's crust, comprising a complex series of aluminosilicates with varying amounts of potassium, sodium and calcium and rarely barium. We can offer A Grade Sodium & Potassium feldspar in the form of chips, lumps and powder. Having years of expertise and skills in this field, we are offering an extensive range of Feldspar Mineral Rock. Our offered Feldspar Mineral Rock is demanded amongst the customers for their long lasting sheen. Furthermore, this product is easy to install and used in homes, industries and many more places.